Targeted traffic is the main thing that keeps every successful online business going. While we can get free targeted traffic from many sources, Search Engines have proven to be the most exciting source of traffic that converts the most. Today, we have someone who’s got a firm grip on attracting search engine traffic and he’s here to share with us how his does this and the results he gets. A little bit after mid 2014, I started to work on my company’s digital marketing and SEO blog. I knew it was going to be a challenge right from the get go. I’m in a niche where most of the competition has been doing it for a long time already. Factoring that it’s still rather small compared to other markets, that doubles the challenge because everybody competing will be on the top spots, let alone, the first 5 pages. This makes the barrier for entry a lot harder for new websites like ours. So I had to come up with a plan and stick with what I do best. After 3 months, we got the site to double in traffic and it’s been growing ever since. Before we start, please note that if you have any trouble with the terms I will be mentioning, please check out our digital marketing & SEO glossary over here. Hopefully, it’s there BUT if it’s not, let us know so we can add it in. Obviously, the organic traffic shown above wasn’t that big. Compared to what you might see with other posts but you have to factor in that we relied solely on optimizing for search traffic with a new site that publishes 1–2 posts per month. The niche, though internet marketing is pretty popular, is not really a mainstream topic that the common person would search for. We have a good enough conversion rate with the traffic that we got as to not bother with other ways to acquire clients. We didn’t publish (yet) on high traffic publications nor were we featured in other sites. We were new and we had to prove something first before we can earn the right to be acknowledged by others, right? It was not easy but it definitely was not luck. We had to put in the work and I’ll show you how we did it. Normally, I would already have a plan in place even before the content creation process starts but in this case, I took over a bit late due to other projects, so I had to work with what I have. We had existing content already on the site that’s specifically geared for those new to digital marketing. We wanted to have a Knowledge area where business owners or new marketers can use as reference to get them started in the online marketing world. I’m a big advocate of keeping things simple. I can drag this out and correlate numbers for you but that’s going to freakin’ bore the heck out of you. You’ll end up leaving Enstine’s blog and we don’t want that to happen! To collect the existing content on the site, I bring out my trusty Screaming Frog app and crawled the website. Odds are, you’ll see empty titles and descriptions. You might even discover duplicates! You’ll probably discover images that aren’t optimized and broken links all around the site. Didn’t do keyword research before you created the content? Here’s a quick tip. Head on over to Google Webmaster Tools. Take a look at the “search queries” and arrange those with the highest impressions. With a single glance, you can see the keywords you are showing up for and where your average ranking is. 5000 impressions but you are at rank 9? 5542 impressions but you are rank 12? 120552 impressions but ranking at 18? That means you are in-range and that traffic is almost within your grasp! You have to act and prioritize these pages. For each keyword, Google will show you a URL that’s showing up. All you need to do now is to improve it and better optimize the page. Since you now have the data, let’s start by fixing the meta titles. Each URL should have a title less than 65 characters. One of the main reasons is that you don’t want Google to cut off your title in the search results. You want the searcher to see your full title. Keep this less that 155 characters. Much like the title, you want this to be optimized and not cut off when Google shows it. A good description and title can get you more clicks sometimes, even if you are a few spots lower than #1. Be sure that you keyword is used in both the title and description. If it’s grammatically wrong, don’t force it. Break the phrase up and make it correct. Open the 404 CSV file. Look at the broken links and redirect them to the correct one. If it’s an old post and the place you are linking to isn’t there anymore, then update the link or remove it. This is also an on-going thing that you need to do. Internal linking serves a lot of purposes. One of the important reasons why you need to do this is that you can lead other people to different pages. They stay longer on your site and they get to discover your other posts. Another is that it passes relevance and much like link building, Google can see the anchor text you use but it also can see the words surrounding the link. When you publish new posts, you can update older posts to link to the new post as long as it’s relevant. Obviously, you can’t go crazy with it and just blindly abuse it. I showed an example about internal linking using your blog here. Note: Internal Linking within the menu OR using a related post plugin are good BUT it can never beat the value of the link within the text body. Do NOT feel bad about linking to other relevant pages. Besides giving you an “excuse” to build real life relationships with others in the same niche, you give Google a signal that you link only to quality resources. Remember this: Don’t link to competitors competing with you on the front page for the same keyword. IF you really have to, just link to their home or about page. Is the keyword in the URL? It would be great if you already did that. If not, then you might want to change the post URL but be sure to set up a 301 redirect, especially if the page has backlinks pointing to it. Check your spread sheet. Look for the pages that use the image. Add in the ALT text using the main keyword or keyword phrase. For further optimize this, you can make sure the filename of the image is optimized for the keyword or use a related phrase. I highly suggest that you also add a title for the image. Optimize the format of the image as well. Something like Smush.it can easily fix those images for you. In WordPress, you can already do these very easily. If you have been blogging for a while now, then you probably built a big database of tags. Click on one of them. See how worthless they are? You might want to no-index them. Category pages can be really useful depending on the niche. If you can customize and add content here, then please do so. IF for some reason, you just can’t add anything unique on the category page, then just no-index them. Grab my Spreadsheet to help you keep track of your content. It’s always easier to do internal linking and keyword targeting if you have a list. That way, you can do just a few at a time and know where you left off. You won’t get stuck. So you look at your Webmaster Tools and see your content ranking low. Take a look at your competitors and compare your content. See the problem? It’s probably not better than those above you. Sometimes their site just has a lot more authority but don’t let that be an excuse. You can still beat them. Google can easily determine and categorize topics now very easily so nudging them with some optimization tactics will give you an edge. From here, you can increase the length, cover more related sub topics, add more media, show graphs/stats and so on. Basically, you need to be evergreen. You want people to keep coming back to your post years later. You want people to make it a resource. It needs to be relevant long term. You want people to engage and like your content. You do this by giving them a great experience when reading it. This can be using images that fit the situation, arranging your header tags to emphasize certain points, maybe add in a table of contents area to make it easier to navigate and link to relevant articles in your site. Check out the HTML Improvements area of your webmaster tools. Be sure to fix all the problems in there. That’s it! The next thing we did was to lay out an editorial calendar for the rest of the year and make sure each post that goes out are up to standard. We’ve gotten some good visibility from that so far. From there, promotion and link building became the focus. Bonus Round: What Else Can You Do? Is your site image-heavy? If so, consider paying for a CDN but be sure you set it up properly. Make sure you have HTML and XML sitemaps (Geo Sitemap for local) plus the general static pages. Consider switching to HTTPS. There, I said it. I have to admit, we had a nice bump in traffic (it almost tripled) and impressions right after we made the switch late 2014 but obviously, the verdict for that is still up in the air. Read more SEO strategies here. Sign up for our newsletter to get more tips in the future. We just sent out a cool Scrapebox (white hat) tip this week to our subscribers. A lot of the best practices for your blog’s SEO is already up there. So go do that audit now and you’d be amazed at what you’d find. Lastly, do not use blogging only for SEO purposes. There are a lot of more profitable ways for you to benefit from your blog and SEO is just one of the means to get there. I’m sure a lot of you reading this have been blogging for years and never considered auditing your website. This process will definitely help you out. Remember, the example is from a very specific niche yet it’s in a very competitive market. In your case, your blog might not be in such a very competitive situation. That means only 1 thing. If a no authority site like ours can get a 100% bump, you can probably do 1000%. Keep hustling, you’ll get there soon. Dennis Seymour is the lead SEO for LeapFroggr Inc, a digital marketing & SEO company based in the Philippines. Say hi to him on his personal blog, Twitter, Google+, Pinterest and Instagram. Getting trageted traffic to a blog/site is really not easy. I try several way to get some traffic from some trageted country. But I fail, I don’t know why, may be I used wrong techniques. Find here some awesome idea and i’ll surely try these methods to get some trageted traffic that will help me to get more revenue from my Blog. I don’t think its that tough when implement the right strategy. Though panda and penguin failed traditional SEO tactics, the new content marketing strategy with social media can leverage the business. Anyways, if you follow Enstine’s blog you will know all the new tactics do get traffic. Very thrilled to read this entire post! I am the fan of Screaming Frog and with your complete guide, it makes me to love it more. Must conduct an audit this coming weekend! Thanks for posting this great guide on Enstine’s blog! I am sure many will love it same like me. Hey Enstine again a Awesome i was waiting for Post Like From a Long Time and Finally it,s here and it,s really very Helpful. How are you man? Been sometime and super stoked to see you at Enstine’s blog! As usual, you nailed it with your SEO tips. Good stuffs and bookmarked. A powerful takeaway is the images. With the right strategy, you can hit #1 spot without much problem (been there, done that). Love that and can’t agree more. Thanks! Been a while alright. Hows it going? I havent been back on your site for a while.I hope the podcast project is going well! Nice tips indeed. It was a very useful and informative case study of your website to increase targeted traffic. I hope the business and blog is going well. Have a great week! It was a pleasure reading the article. You’ve provided a very high value piece of content. Now, I’m trying to bring these tips into action. Hey Dennis nice to see you at Enstine’s blog. I have commented at your blog many times if you remember it Dennis. 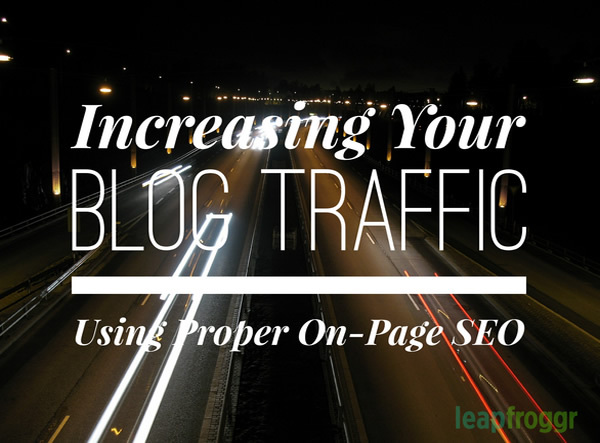 ON Page SEO is definitely one of the most important things for bloggers. We may build many backlinks, but without proper On Page SEO we won’t be able to achieve anything. I give importance to internal linking, proper description, external linking as well as I regularly try to improve the content quality. I avoid keyword stuffing as it is not a good thing. We need to target the right keywords and we need to optimize the content by including the keywords at the right places in the blog posts. Dennis, SEO audit is definitely helpful. It may help in knowing the reasons which may not be allowing the traffic to increase. I know many bloggers who just concentrate a lot on ON Page SEO and have been able to get lot of success. Hope to read more guest posts by you and at the same time I hope to see you at my blog too. Of course I remember and Im thankful! Hope the blog is going well! Enjoy the week Mohit! Thanks for sharing very helpful information. SEO is one of the most important factor for the success of a blog or website. It is really necessary to optimize pages and content for search engines to drive targeted traffic..
You have nicely put all helpful on-page SEO tips here. keep sharing more helpful information. I appreciate you sharing your thoughts very much. I hope this post has given you enough value for the time it took to read it! Talk again soon. Have a great week! On page seo is really important to tell search engines exactly for which keyword it has to rank our site and how well our website is optimized for that keyword. I always focus strongly on these methods. Thanks. It’s still the same. I didnt really use WordPress because its a requirement. You have to go to blogspots html to edit those. Im not sure if they give you an alt text option in their GUI at the moment. The rest of the codes you can easily generate with online html tools. Or if you want to check the existing codes on your side, if you are using chrome, check the source and search for the meta title and the meta description. Either way, screaming frog still works for it so just use that. That’s a great article, thanks. With lots of implementable tips. Sounds like I need to do an audit of my site! I fix “bad old content” when I come across it, but it had never occurred to me that there was something out there that would point me in the direction of the “quick wins” you highlight. I’m liking the sound of that! You should definitely do this if you have some free time. It’ll save you a ton of time down the road. Find those pages, improve them, rank them better, get more traffic! Thanks for your hard work here, and you too have a great week! Dont worry about it being technical. Just do it once and you’ll instantly see how its not technical at all. Using a smartphone is harder than SEO! Nothing much to comment now! I try to make it a practice to check my Google Webmaster Tools daily, but I still don’t utilise it as much as I should. I also forget about Bing Webmaster Tools most of the time. These audits are necessary to keep everything clean and efficient. And as you said, by applying your sound advice, much can be accomplished. I look forward to applying more of this advice. Thanks for sharing. Bing’s WMT isnt as good as Google nor Yandex so just focus on Googles for now. Yeah, take a little time this weekend to run an audit and compare with your webmaster data. It’ll show you a lot of things and potential traffic you are missing. Good luck and enjoy the week! Incrdeible point described indeed. If you have shared something new in your blog then no doubt you will get traffic increase in traffic. Every time i visit your blog , got some thing new. @Dennis very good effort. I’ve just been concentrating on writing decent content for now. I guess it’s about time to do some proper SEO work. Thanks for the ideas in this article, some were new to me. Thanks for stopping by and leaving your thoughts! Always appreciated. It’s great to see you here on Enstine’s site! I’m not sure if this is good or bad; but I haven’t really spent much time focusing on SEO on purpose. However, as you know I tend to put most of my focus on connecting with those who I believe have a certain level of influence and serve the same audience I serve but in a different way. It’s has been HUGE for me and my business is really growing; and at the center of it all is my blog. I hope you have a great week Dennis! Great choice Enstine!!!!!! I’d be interested to look at those stats for your 1 year theory! Make a post out of that after May! Good to see you doing what you know best on Enstine blog, welcome. Because am thinking of revlancy here and showing Google what sort of friends you’re hanging out with. Thank you for writing this informative post on SEO. Sure. It’s mainly for ranking reasons. Linking to the exact pages that you are competing with just gives them extra leverage. Just link to another page of theirs and not the exact ranking URL. First of all a great article. These days there are lot of free tools available that can help you improve your on page seo, so it doesn’t take much time to get your things on place, but one surely needs right things at those place. All of us only need to know the right keywords to get things like focus keywords, meta tags, alt tags right, and by using tools we just need to fill in the columns and no need to edit the html, making it quick. Yeah, there are also a lot of crappy tools. Onpage SEO will always be about the knowledge of the user and the work ethic/commitment to further implement them. Thanks for this effective post. On-page optimization is an important part of the overall SEO of the website. And as it helps in getting targeted traffic, one must excel in the art of on page optimization. Targeted visitors helps in conversion rate. I must say, very nice post. I always like reading actionable tips and action plans rather that all theoretical stuffs. On Page Seo should be the first thing to consider if its all about getting huge traffic as well as along with On Page Seo, on must nor forget the quality of content, as we all know, content is king. Just stuffing the content with keywords decreases the quality. So, if you are good at On Page SEO and Quality Content, you are sure to get good traffic. Btw Thanks for sharing such useful post. Great post Dennis! I love Screaming Frog for site audit and also Xenu’s Link Sleuth along with it to find broken links. In this post you talked about category pages, actually there isn’t that much to add content in it, best thing I guess to add a category description area in that page and subscription option of that category posts. It’s always better to noindex tag pages though. BTW I loved the content audit spreadsheet though. Keep up the good work! ON Page factor is the most essential factor of SEO. If your on-page is strong then you will need not to worry about google updates. Make sure to follow all guidelines and make attractive SEO rich website. Target traffic is more important for selling more products. On page SEO will help anyone to get rank in search engine. This post was good and i think it will need the bloggers who are newbies. As a new blogger always want to learn new things.. visiting the pro blogger post is always a eduction … S.E.O looks like simple title, description, internal links etc… so many but how to use it is a knowledge .. thanks for 404 redirect thing in this post.. in my webmaster showing some errors which i did not fix.. after this comment i will fix.. thanks for the post. will visit regularly to catch your posts.. Thanks Tonmoy! Take your time learning them. Apply them each time. You’ll be happy with the results. Good luck with the blog and enjoy the weekend! This is a great post about on page SEO . The site audit thing was not known to me much and this post have clearly explained how to optimize my site in short spam of time . Many people keep asking how to do on page seo for already posted articles on a blog , This post is answer for them. Thanks for sharing these great tips . Getting targeted traffic to a blog/site is really not easy. you need an Expert advice to achieve the get the targeted results and achieve high rate of return on your investment. SEO is very important for any business in today market. All people want that they get more and more traffic on their website. In your post the way you explain all the things that how we get traffic from only doing on page SEO are commendable. On Page and Off Page there are two way of getting traffic on website or blog. If we doing on page SEO in correct way they give excellent result to a website. So it is very important that whatever way we choose for increasing traffic we doing it correctly with follow all Google guideline. i can read excellent tips in this article. you have done great job man. there are many points which attracted me to read the entire article. two of them are url 301 permanent redirection and external links. Definitely very useful article about on page SEO. Yes, we need to follow on page seo correctly to get good results on the SERPs. Webmaster tool is a good tool which can help us in many ways. Wee should always remember not to over optimize our site. If we do then search engines will give penalty our site. Anyway, very informative article you shared with us. Keep it up. You article is really very useful since you shared some of the new points which were not know to me.. i am going to make useful to these tips as well.. This is awesome post indeed! Without ON Page SEO, we can’t rank in Search Engines. Yeah, as long as you apply for the basic on page work since you are already creating content. Why not make the most of it right? “Remember this: Don’t link to competitors competing with you on the front page for the same keyword.” This is what I was searching for last some weeks, you have cleared one of my great doubt. Even I have linked to some of my competitors and was giving link juice to them in some of my posts. I have removed those now and as you said to link to their about or home page, yes I did it. Thanks For sharing a good article for on page SEO blogging, on page SEO it’s really an important part of the website.